If ever there was a critical time in which doctors needed to bury their present and past differences and speak as a collective it is in the remaining few weeks before the consultation deadline on the National Health Insurance (NHI) Green Paper. The NHI, aimed at creating equity and accessibility, will - for better or for worse - forever change the face of South African health care. 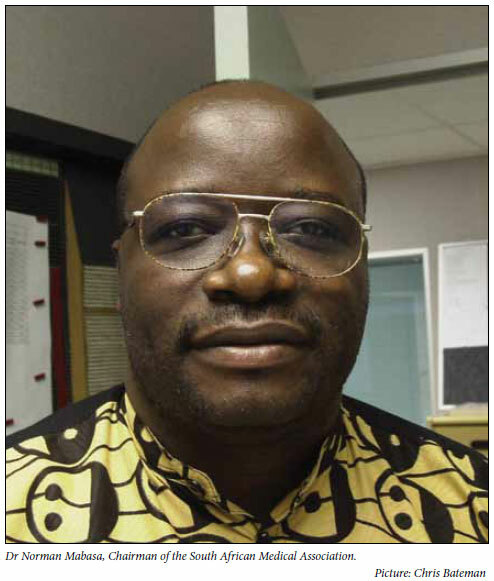 Dr Norman Mabasa, Chairman of the South African Medical Association (SAMA), said positively influencing how that change comes about will require urgent, unprecedented doctor consensus and input before 12 October. 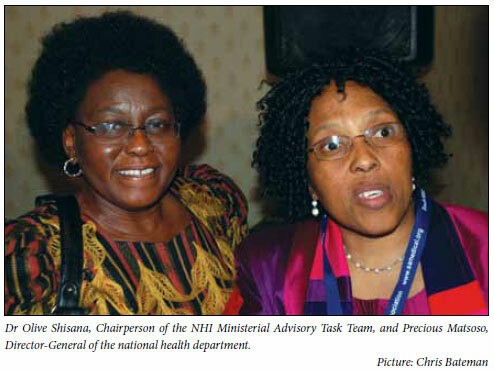 While agreeing with key stakeholders, such as the Hospital Association of South Africa (HASA), that the 3-month consultation time-frame was too short, Mabasa (unlike some other key stakeholder representatives), was undaunted by the lack of detail in several vital areas of the long-awaited Green Paper. 'I see that as a good thing. It means we can firm up the areas where we want detail. It shows that the intention is not dictatorial ... the moment things are very detailed, you know you're not being consulted. What surprised me most was that it didn't have all the detailed stuff that people were so afraid of and about which they speculated wildly. This is a unique opportunity for engagement,' he added. Mabasa said he would not be surprised if the deadline for public engagement was extended, given the important and all encompassing nature of the changes. When pressed on what he thought was a fair and reasonable consultation period, he replied 'between four and six months, at least'. He urged his colleagues to make their inputs to SAMA's specially prepared website, so there could be a meaningful distillation of views. 'I'd like to encourage all doctors in their various groupings to bury their differences and focus on commenting so we can come with a collective idea on how we want it to be run. There's never been a better time to make meaningful input into shaping our future health care policy. We have to be a part of that change or face being changed by it,' he added. While providing a lot more flesh to the jealously guarded skeleton, the Green Paper still lacks vital detail on at least four key aspects. Key spokespeople in civil society and the private sector questioned how meaningful engagement on this detail would be possible inside the small consultation window. They pointed to the void on what funding models will be used (besides that individuals, employers and the national coffers will be drawn on), what the income threshold is above which contributions will be mandatory, what treatment packages will be available at what hospitals and clinics and what role will be played by private health care providers contracted to deliver services. 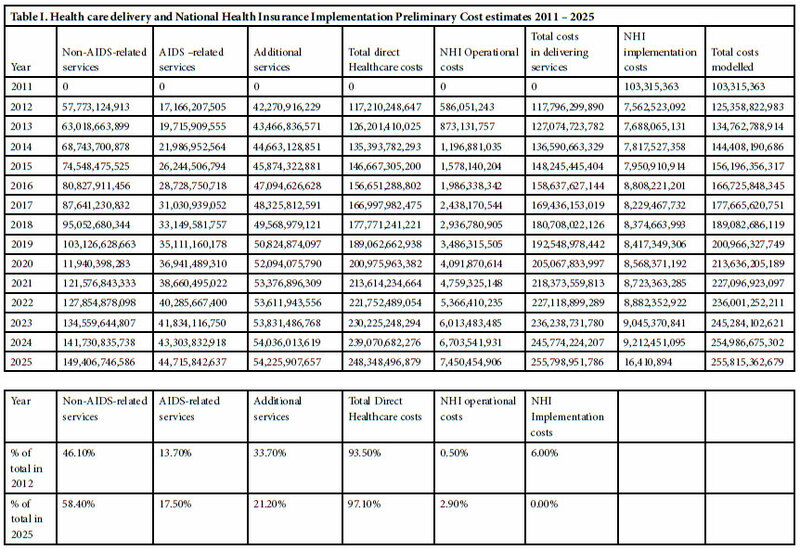 The greatest skepticism however was reserved for the efficacy of a funding model that will of necessity lean heavily on just over 10% of the populace (those who pay taxes), given an NHI budget that soars to R214 billion by 2020 (from a once-off funding of R125 billion exclusively from Treasury next year) (Table I). 'We're genuinely concerned that South Africa's small tax base will not be able to bear the financial brunt of this large socio-economic need,' said Dennis George, General Secretary of the Federated Unions of SA (FEDUSA). Matlala said given the 'extensive and lengthy' time taken by government to develop the paper, public consultation of three months was unusually short for valuable input from the public and civil society. His concern was echoed by, among others, the Helen Suzman Foundation which highlighted the societal and fiscal impact of the proposals. The historically effective Treatment Action Campaign (TAC) and Section 27, a public interest law centre, were worried about access for refugees, asylum seekers and non-citizens, and the structure and governance of an NHI. They want to see solid measures ensuring transparency of tariff structures, reasonableness of prices, significant improvements in the quality of public health and greater clarity around the status and powers of the proposed office of health standards compliance. They said the Green Paper did not cover the future role of medical scheme administrators and what the benefit packages would be. The greatest divide in reaction however followed ideological lines. The major unions were broadly supportive (in spite of the National Union of Mineworkers (NUMSA) admitting that their members' medical aid contributions could unilaterally increase by as much as 15%), citing the break from the apartheid era's unequal health care system and its legacy in which 84% of the population were still unable to afford decent health care (which is confined mostly to the private sector). Cosatu shared NUMSA's concern on the proposed introduction of a multipayer system, which it felt might see private health schemes being allowed to charge the government for a portion of their services. This could allow medical schemes to 'continue to rip off their clients' and be subsidised by taxpayers, they said. Heidi Kruger, Board of Healthcare Funders (BHF), said the proposed risk-adjusted capitation system (adjusting rates based on factors like age or illness) would constructively promote good-quality outcomes and minimise the potential for fraud and over-servicing. The BHF backed the NHI's diagnosis-related groups (reimbursing according to the treatment required for a condition such as heart failure, instead of just costs incurred), which it had 'used for years' as a method of analysing quality and reducing risk for reimbursing hospitals. However, she urged that a health care pricing forum be set up so that medical schemes could at least be sustainable in the run-up to the NHI, adding that the current Prescribed Minimum Benefits also urgently needed review. Business Unity SA warned that the cost, design and institutional changes would require vigorous debate. 'If additional funds are to be allocated to public health, it is imperative that they be effectively used.' The concepts contained in the Green Paper would affect household budgets, public finance and the labour market; therefore phasing in and consultation with the National Economic Development and Labour Council were imperative. Leading Johannesburg newspaper, Business Day, said in an editorial that the 'elephant in the room' - i.e. how the new system would be funded - had still not been dealt with in a 'forthright and comprehensive manner'. 'There is no disputing that the South African health system is dysfunctional, but introducing compulsory NHI without first ensuring that existing state health facilities and personnel are considerably improved, and that the model chosen to finance it is sustainable, could have serious negative economic and political consequences. The worst-case scenario - a far larger but no less dysfunctional public health system funded at the expense of the existing costly yet functional private health care sector - might not bring the ANC down but would ensure that it lost the support of the middle class of all race groups for the foreseeable future. 'Of course, the converse - quality basic health care for all at a combination of state and private facilities without an excessive additional overall burden on those currently contributing to private medical schemes - would be a huge feather in the ANC's cap and go a long way towards reversing some of its electoral losses among middle class voters'. The problem was, however, that while Dr Motsoaledi appeared to recognise the two main threats to the success of the NHI, the Green Paper failed to instil confidence that the ANC had the political will required to 'stop the rot' in state hospitals and give South Africans 'more bang for their tax buck', or the courage to be up-front that for the NHI to succeed, middle-income taxpayers would either have to pay more for the same level of health care or settle for a lower standard of care than they were accustomed to.